Everybody’s talking about info products. E-books. Audiobooks. Video courses. Podcasts. Training programs. And the accepted wisdom is that if you want to succeed online – to be really profitable – then you need to have one, too. Ideally, more than one – an entire funnel of them. Is it just a matter of repackaging some blog posts and saving it as a PDF? Turning on a flip camera and talking for a while? 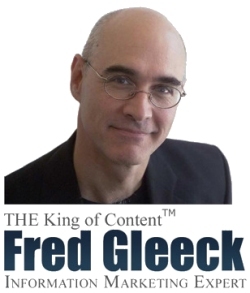 There’s a lot more to it than that, and I wanted to get you advice from the very best of the best – which is why I tracked down Fred Gleeck, the guy who’s been in the information marketing business for longer than maybe anybody else (with over 4,000 hours of content created!). Plus, he’s managed to hang on to his ethics and integrity along the way (a rarity these days, unfortunately). It was a great interview, and I’m very pleased to share it with you. Enjoy! “Information Marketing” has so many negative connotations because there are lots of people out there selling crap under the term. Remember that it’s really about providing valuable information in an effective format to people who need it. Don’t create an information product because you think you should, or you’re just looking to make money – you have to have knowledge and passion, and at least some idea of how to educate. Make sure that you have something to say that is new – not necessarily new information – but at least a new way of presenting it. The one thing, above all others, that will be help you be successful is taking a long-term view of your business. You'[re not going to succeed overnight, so plan to work (hard!) for two to four years. If you want success in 90 days, you’d be better off buying lottery tickets then trying to create an information marketing business or product. Get educated before you get started, both in how your audience processes information, and from a mentor whose system you like and trust. While you may outsource parts of your business process in the future, at the beginning, it will be to your benefit to try and do everything yourself, to learn how it’s done and what it’s worth. Try to do two or three small things every day that take you close to where you want to be eventually, in your business and your life. When you come to my site, you’ll have a chance to get a sense of what I offer, and how valuable it can be – then, maybe someday, our relationship can go further. 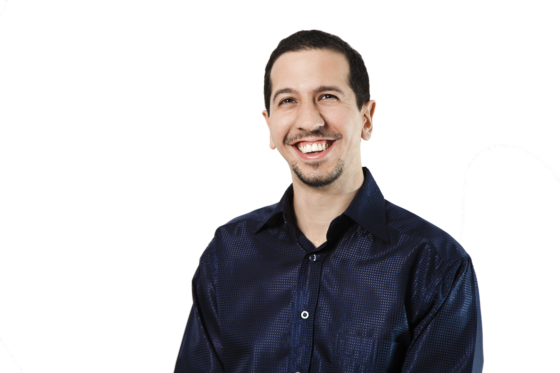 Danny: Hi Everyone I’m Danny from Mirasee, and I’m very excited to be on the line today with Fred Gleeck. Fred is the author of multiple books one of which is called Sell Your Brain Power. He is the creator of more information products that I can really count, and I can count pretty high, so that’s saying a lot, you’re going to learn all about Fred all over the course of the interview, you’re going to hear a lot from him and learn some really interesting things that he has to teach you, but Fred, let me start by saying thank you very much for being here. Fred: Well thank you very much for having me. Danny: My pleasure. Maybe we can open up with – I’d like to hear in your own words: who are you and why are you awesome? Fred: Yeah, well, I’m awesome because my step kids think I’m awesome, that’s the main thing. But I was, I had sort of an unusual background Danny, I was born in Japan and raised in the Philippines, and my dad was a diplomat, so I lucked out, was born to the right parents. And growing up, I had dreams of becoming a professional golfer, until I got to the United States and realize that I was deluded, and I wasn’t nearly as good as I thought I was. So I started trying to figure out, you know, what else I could do, and I have this, sort of theater background and interest, and my parents said: “Well, that’s great, but we won’t pay for that. If you want to do it yourself, you pay for it.” So I always had this sort of theater inclination inside me, although I got a background in business and marketing. And in terms of college, and so I got I started to figure out or try to figure out a way to combine my interest in theater with a business background so I started doing what I refer to as business theater, which was seminars on business topics. And, as I did that I started to watch the people that were really successful and the people that were really successful were those who have a lot of stuff to sell whenever they spoke. So I realized fairly early on that the money in the business was in the stuff that you sell. The products. And so I got really interested in the process of how do you create audios and videos and all that kind of stuff. So over the years, I’ve literally produced thousands of hours of audio and video materials both for myself and for my clients and I still do a lot of that today, but primarily doing it online as well as, you know, when I do speak, I always come armed with stuff to sell, so that’s really a little bit about me. Danny: Cool. So, officially, the way you describe your business, at least in Sell Your Brain Power, is you’re in the business of information marketing, is that right? Fred: That is right, yeah, I am in the business of creating, packaging and marketing information in various forms, be it audio, video, text in the form of books or PDFs and also in experiential events like seminars and boot camps and teleseminars, webinars, all those kinds of things. Danny: Cool, so let me put a question to you because I’m, we’re very much the same kind of business, and I never describe it as information marketing, and I know that that’s a like, an angle that you’re trying to kind of corner, which is not why I wouldn’t describe it as such. But, so here’s what I’m thinking, I mean, information marketing has become a very kind of loaded term with a lot of connotations both positive and negative. I mean, I think there are a lot of people in the space who have given it the connotation of kind of being about selling air, selling nothing. Danny: And there’s a lot of kind of get rich quick connotations about it, which is why I kind of describe it as, you know, I’m in the education business, which is how I think the way you kind of go about it, it’s really what you do as well, but I’d love to hear what you think of this, you know, this connotation and where it kind of came from and what does it mean for, for people who are thinking about information marketing or being in the education business. And what is the real value of education? Fred: Yeah, I think I agree with you, I think that education probably is a better word to describe what I do, but I think that, education can mean something other than information marketing. I think you can educate people by using a lot of the tools that we use in information marketing. But I guess the terms are somewhat synonymous, but I think the reason why information marketing as a term has some, you know, some bad feelings for many people is that there are a lot of individuals, many names you would know, I would know, who have basically found a way to market information products, but everything that they tend to market, and the reason why it’s got such a bad name is oftentimes, people will say: “oh, you’ve got to buy this new audio thing that I have.” And all this new audio thing that he or she sells is just a teaser to get you to buy the next thing that they’re going to try and sell you which again contains nothing other than vacuous promises about how the next item will in fact give you your answers and so on, and so on. So that the reason why people have this sort of negative connotation about information marketing, is that very often, people have been taking advantage of people by continuing to tease them with a product that claims to have content, but is nothing but a sales message, and I think that’s the reason why people have sort of soured on the term “information marketing” because they’ve been involved with people where this has been the case. Danny: I think there’s also an issue of kind of, ubiquity and low barriers to entry, kind of what we’re seeing in the eBook space a little bit, on Kindle now, where anyone can jump in and publish a book, and that it would seem to de-value Kindle books which is not the case at all, there are lots of great books on Kindle. There is kind of this mindset and I hear bloggers and entrepreneurs talk about all the time like, well I want to grow the audience, and once I’ve got, you know, a few hundred subscribers, I’ve got to put together an info product, and they say it in this kind of, oh well, it must be done this way, and this kind of non-chalant kind of way, that’s like: look it’s not about writing a fifteen page report and slapping a price tag on it, it’s, like, there, there is actual work and, and thought that has to go into creating something of genuine value. Fred: Yeah, and often times people, as you and I both know, who are creating things aren’t really creating things of genuine value, they’re creating things that really aren’t very valuable and oftentimes, I’ve seen so many offers and people have sent me stuff and said, yeah, there’s nothing – people who sell this stuff, a lot of times there’s nothing really there, it’s just kind of crap and so, you really do need to produce something of value, because if you don’t, your customers won’t buy from you again. Fred: Yeah, I mean I think that that’s again, people have been told: “oh you need to put something together.” Be it a report or an eBook or whatever it is, and they slap something together which really doesn’t, and all it does is just sort of take a few other people’s ideas and sort of, you know, puts them together, conglomerates them and that’s not really, you know, it’s really not adding anything to the discussion, all it is, is just sort of muddying the waters. Danny: So, people are sold a lot of, and the, you know, kind of, pun intended, but they’re sold a lot of information about how to go about creating information products and a lot of it’s very bad, it makes it sound a lot easier, a lot simpler, you know “you just need to turn on a flip camera and talk for twenty minutes” and you know, that kind of a device. What really goes into creating an information product and a valuable information product, of course, and how can our listeners tell whether they’re ready to do that in terms of what they’re bringing to the table in terms of where they are and the growth of their business? Fred: Well I think that, number one thing is, is that a real understanding of who it is, who is eventually going to be buying the product that you are going to be selling and an understanding of how the customer, potential customer would best need to learn that information. So the first decision point is, you know, how would this information be best communicated? So if I’m talking to somebody, one of my clients one time was a chef. Now, in, in terms of showing people how to whisk an egg you can’t describe that in an audio, it needs a visual, so it has to be something visual. But people oftentimes say, well I’m going to write an eBook. Well, if you’re going to write an eBook about a topic that doesn’t best lend itself to being taught using text, then an eBook is not the right way to go. You have to think about it, if somebody wants to learn how to play golf, they probably would be better off with videos than they would with text. There are plenty of golf magazines, but those golf magazines, when you open them up have plenty of illustrations. And so in fact, everything that needs to be taught, needs to be thought about through the eyes of the person who is eventually going to be doing the learning, and the question then becomes, how would this person best learn how this particular thing that I’m trying to teach should best be, you know, incorporated into their thinking? So I think a lot of times, people just automatically say, well I’m going to write an eBook. Well, I don’t know if you should write an eBook, what’s the topic, what are we going to be teaching people? And there are other things that audio might be better and, and other things in which text is the better way to go. Now, we know that people learn using different modalities of learning and some people prefer to learn via text or reading, other people prefer to learn audio other people prefer to learn through coming to an experiential event like a seminar, but the question is a combination of how do you the person who is going to be buying this, how do you, how are you best going to learn the material, combined with what is your primary method of learning and which modality best suits you? So we want to balance the two of those things, and when someone is thinking about creating an information product, you have to put yourself first in the mindset of the person who will be buying it and learning the material. And the biggest thing that you need to do after you take those steps of deciding which medium to use is then to understand a little bit about a fancy term called instructional design. Which basically is how do people learn and what, you know, what do we need to do and frequently, what I find and, I’m sure Danny, you find the same thing, is that oftentimes, people who are trying to teach something, they know it so well that they leave out steps. And for the person who is learning something for the first time, to give them the A-Z map, but to leave out R and T and V really confuses them because what happens is people get into some materials that aren’t very well thought-out or well produced and they end up with missing steps. And so the big thing is, you know, what medium best serves your eventual buyer or you reader, your learner? And also, putting things together in a roadmap that does not leave out a step. Danny: And where does an examination of the competitive landscape in terms of value-add come into play? Like I’m not talking about kind of a marketing positioning piece of you know obviously you have to have a unique defensible value proposition, I’m thinking more in terms of, let’s say you want to create an information product about golf, you’ve aggregated an audience who is interested in golf, you identify a need, would you survey the market to see if there is already a good product that kind of does what I want to do? Danny: Or should they jump in and do it? Fred: I think you’d probably you know what you’re looking for is what I all “business caulking”. And caulking when you’re dealing with construction has to do with filling in the gaps, usually around windows or doors so that no air can come through or come out if you’re air conditioning in the summer or heating in the winter. And business caulking is about looking for the gaps in the market, so if you’re going to be producing a product in the golf market, you want to see what is out there. In a case like golf as an example, there are so many different audios, videos, all kinds of training materials in that area, so you can’t oftentimes find, you’re going to try and find an underserved area within a market, but, understanding that another element of success, selling information is that my perspective on how to teach something and my perspective on the topic of golf might be very different than your perspective and therefore, some of the materials that we produced are what we call instructor-dependant. Which means that, just because I might be rehashing a topic that you have hear before, I have a unique way of presenting therefore it makes is salable. So, for example,Tony Robbins took an existing technology of neuro-linguistic programming that was done by Brandler and Brinder, whatever, I always forget what their exact names are, but he took an existing technology and he became the new spokesperson. And so his material then, was very instructor dependant because people were not just buying neural linguistic programming, they were buying Tony Robbins because of the individual, so I think that you, yes, you want to look for a gap in the market, yes you want to do your competitive research to find out what hasn’t been covered, yes you want to do business caulking, but you also have to understand that each one of us has a unique approach and a unique slant to teaching and training anything and that is something. And some people, by the way, will love you and other people will hate you because they may not like the way you look because you look like their ex brother-in-law who they had fights with. So it’s all about a combination of delivering information properly and being who you area and having that resonate with your audience. Does that make sense? Danny: It does, but I want to push back on something that you just said and, you know, kind of ask you to clarify, because, like I absolutely agree that there is an instructor dependant component to education. There is very little that is quote unquote new under the sun, and when you have a brilliant new idea, you know, that’s incredibly valuable. But I mean, I’m in the marketing education business, right? Marketing is not new. Marketing is fundamentally about getting people know what you have and see the alignment and see the fit, that’s been the same for thousands of years. So some of it is technology and its emerging trends and all that kind of stuff, but a lot of it is just, it is instructor dependant and there’s clearly a gap because so many people out there are bad at it. And so, no question about the importance of instructor dependent content, but does that mean, like I have seen a lot of people selling the whole, you know, go and create an info product because you’re a unique position, your unique perspective is valuable, regardless of who you are, just because it’s unique. Is that the case, or is it more a matter of almost another side or another facet to that business caulking where you’ve got a voice and a perspective that addresses a gap in the way things are taught? In other words, was Tony Robbins successful with his perspective because he’s Tony Robbins and it’s his perspective? Or was he just some other, he was just another Tony? Fred: Well I think it, I mean, your point is well taken in that you have to have and instructor that again, will resonate with a certain number of the people out there, and hopefully that will be a larger number rather than a lesser number. But you also have to have, maybe, a different way of training on the material that is more effective and is quicker and easier to learn pick up on. So, I think it’s a combination that it’s both a personality oriented thing where you like a particular, when I think back to my college classes, there were certain instructors that I really, really liked. I don’t think that if I just liked them personally, and yet they weren’t very good at teaching, it would’ve worked, so it’s a combination of the two. I think you’re right in that you have to have both a personality that you resonate with and also an approach to training and learning that is, that is more effective, and frankly, most people who are out there, attempting to create information products have no background whatsoever in education, and haven’t even made an effort to learn it because they’ve been taught that all you have to do is set up a flip camera as you said, turn it on, and go. And that’s not really what creates effective products. It’s an understanding of the education process that, that you’re as a marketing educator and me as an information marketing educator are so, you know, so concerned and understand how to do. Danny: So how can our listeners who, or anyone who’s reading the transcript to this, how can they know, whether they’re in a position to go ahead and create something, they have that unique perspective on how to deliver the material their unique styles as a trainer/instructor, or maybe they need to go back to the drawing board and learn a little more and if that’s the case, where should they go? Fred: Yeah, I mean, I think it’s this is both an art and a science, so I don’t think that I can give you the, an answer that everybody will find completely satisfying. Number one is, I think you have to really, number one, know your topic. And by knowing your topic, I don’t think you have to know it better than anyone in the world, but you have to know it better than say 95% of the people out there. Now again, the 5% of the people know more about it than you won’t be buying this product from you anyway, that’s number one. So secondly, after you get your satisfied you’re more knowledgeable than 95% of the people out there, then the question is: how good are you at creating information and educating? How good are you as an educator? And if you hear me ask that question and you say: “Uhhh, I’m not really sure.” Then chances are you need some education about how to educate. And you need some instruction on how to get, sort of a better handle on what, what the process is and you’ll need to do a little bit more learning in that area. So I think that it’s, it’s number one, you know, you know me and, and thirdly of course, you shouldn’t be doing and putting together material solely for the purpose of making money, they should be a little bit of passion behind it because I don’t really understand the people who are sort of mercenaries in this field, where all they do is produce materials strictly to make money. I just think that’s a formula for disaster because it’s really tough to stay in it for as long as you need to be in it to make things work if you don’t have passion. So a combination of those three things: the passion, the knowledge of how to educate and also being more knowledgeable than most of the people out there, I think those are the tree components that you must have before you get started. Danny: I think that’s very well put and I think that, you know, the rule of thumb kind of quick test is, if someone who doesn’t know anything about the subject comes to you and says “I don’t know anything about this can you explain it to me?” Can you explain it to them in a way that will actually you know, two weeks from now or a month from now they’re going to remember it and understand it well enough to do something. Fred: Yep. Yep, I’d agree. Danny: So let me ask you this, let’s say our listeners have kind of said: “Okay, you know what, I think I understand my space well enough, I’m not, you know, the world’s expert, but I definitely know more than 90-95% of people, I have stuff that I can share with them and I’ve, you know, I’ve had clients, I’ve had people come to me, they like the way I deliver information, the following is there, I think I’m going to create something. I’m sure you will have seen a lot of people go through a lot of kind of false starts where they’ll star and then stop and then start and then stop to try and create something and it doesn’t materialize until they create something that does. Is there something that is kind of consistent where, you know, this is what you see people doing differently when they get it right? Fred: Yeah, I’ll give you a perfect example. I just started working with a guy, I have a lot of, well I have number of what I call joint venture partners where they come to me with knowledge in a particular area or subject and I come to them with a knowledge of the process and the systems for information marketing. Now, and I’ll, I’ll give you a perfect example. A guy that I got together with yesterday, he and I are working on two sort of different areas together. He plays a lot of poker and he is also, he has a condition called spasmodic dysphonia, for those of you listening it’s a condition that makes it so that instead of speaking in a normal voice that we would, he actually speaks in what sounds like a forced whisper and it comes on very quickly and so what he, he reason why I’m interested and decided to work with him on both of these projects is because I noticed in him, he’s also learning how to do jujitsu, and he wants to become a black belt I said: “wow, how long will it take to become a black belt?” And he said: “well you can go to some instructors and they move you along rather quickly and some people can do it in three and a half years.” And I said: “well what about your instructor?” And he said: “no, no, my instructor is one of those guys who makes you, you know, it’s going to take me ten years.” I said: “well why would you want to work with someone like that?” He said” “well you know I want to get it done right.” This guy is one of the best in the world and so the reason why I want to work with this guy Greg is that Greg has a long-view on things. And by long-view I think that one of the biggest criteria that I’ve seen that makes people successful in this business is an understanding that although you are told by many gurus that you can make a million dollars in 90 days, in almost every case, you’d be better off playing the lottery. So, if you don’t approach any of these topics with a long view orientation that it’s going to take a while… And I always, I tell people, I don’t BS them, I tell them: “look, if you’re serious about getting into the information marketing business, you really should look at between two to four years to really make something happen. To really replace your current income.” I mean, I’ve oftentimes, when I’m giving a seminar. I ask people, you know, how many of you people went to college and the vast majority of the hands go up and I say: “okay, so now, you worked and went through four years of education to become the indentured servant of some large corporation – how is it that you think that in 90 days you’re going to quickly become a millionaire?” It’s sort of like when I first got out of grad school, I thought I should be appointed vice president of any company I worked with overnight. It’s just not going to happen. You know, so that’s I think the single biggest criteria over and above knowledge and expertise in a topic is the ability to see the long view. I think that, the primary method, and that’s why I like, I like the idea of working with this guy Greg, because clearly if he could see that for jujitsu, he also, that’s transferable, and he sees that in the other businesses we’re working on together. Danny: I think that’s really, really well put, and it’s, I mean I relate to the example in particular because I’ve studied jujitsu for over a decade. It really is, you have to take the long-view and I think a good way to, kind of… because I see people come to me all the time, they’re like: “I’m thinking of starting this business and that business…” Starting a, a whether it’s an online business, offline business, an information based business, it’s not a way to fix what’s broken in your life right now. If you hate your job and you’ve got to get out of your job, starting a blog and replacing your income in three months is… it’s not going to happen. Danny: Right? If you hate your job, find a better job. If you’re income is not enough to pay your bills, find a way to supplement it. Creating a business, any kind of business including an information-based business, it’s about your life plan. It’s about where you’re going in the next two to four years as you said. And in that case it’s absolutely – I mean, you know if you’re looking to create a, 50K, 60K, 160K, you know, quarter of a million dollar whatever it is, income, of course it’s going to take time. And yet, there are these really ridiculous expectations that people have been led to have by a lot of these people who are spreading frankly – lies. Fred: Yep, I agree 100%. Danny: And I mean, it’s not that you can’t, you know, as they say, make a million dollars in 90 days, it’s just, I mean, you know, Apple makes a million dollars every ninety days. But they worked hard to get there. Danny: They do it, but they’re not just starting out. Danny: Absolutely, I mean, and you know it’s a little off-topic in a way, but it’s also very related, you know, if you look at the success of Facebook. You know, is Zuckerberg a genius? Yes. Did he do things very well? Yes. But he was also in the right place at the right time with one of the very few ideas that could actually balloon that fast. Danny: Or reach that scale. I mean you can be in, you can be a genius and have a great idea and build a good business, but it just, it might not be able to grow to the potential of a Facebook, to the size of a Facebook. Danny: And so, yeah, you’ve got to be realistic about those expectations. So, I know that we’re, we’re kind of running short on time and I want to, I want to be respectful of your time. Let me ask you two more questions. Danny: The first question is: You know, we’ve got good people at Mirasee, we’ve got smart people that are not in the, you know, “I want to make million dollars on Twitter in 90 days”, kind of space they understand that they’re building something real, for themselves, otherwise they wouldn’t be on this blog. They’re willing to be in for the long haul, they don’t want to create just a pile of crap. So, you know, they’re digging in they’re ready to do their work. Are there any big pitfalls that they should avoid, or…I don’t want to say shortcuts, but, you know, best routes that they should take? Like what guidance can you offer them over the coming weeks, months and you know, possibly years? Danny: But there’s in the marketing space, there’s a lot of kind of one-trick ponies, where whether they have success with AdWords, or with webinars or with SEO or whatever the one thing is, they’ve got that one hammer and then everything looks like a nail. It’s important to find someone who really has that broad systematic knowledge and understanding as opposed to this one trick that maybe they got lucky with one time. Fred: Absolutely, agree. Yeah, you’re right, and what happens is we know whether it’s in the pay-per-click space, because I can think of someone immediately in that area, where you know, then since I know Pay-Per-Click, everybody should be using Pay-Per-Click. And that’s, you know that’s false, because for some people that may not work at all. And so, Joe the plumber, yeah, he’s going to do your plumbing, this guy can do your Pay-Per-Click, if in fact that’s what you need as part of the greater system and you need someone who has that system sort of overview knowledge that you, that is as important as individual pieces. Danny: Absolutely. So, go on, I didn’t mean to cut you off. Fred: No, no, no, no. So I mean, if you find someone who has this system knowledge and who also, as a result of you know, you’ve spent some time with them and you know you have a good ethical match and you know you’ve got good personality match with them, so the next thing then is the understanding as everybody should have by now, because we talked about it, is an understanding that this isn’t going to happen overnight, okay? So now, knowing those two things, the next thing is to identify which of the pieces of the system you can do yourself and which of the pieces of the system you’re going to need help with from other say, outside vendors or outside sources. And I think a lot of times, you know, I know that in my case, when you’re first getting started, you know, if money is an issue, you’re going to probably have to try and do a lot of these things yourself, and that isn’t necessarily a bad idea. Because, for example, with writing copy, I always encourage people to write their own copy understanding that in the future they may hire someone to write copy for them, but unless you’ve done something or tried to do something yourself, it’s very difficult to assess how much people should be charging you, how difficult it is, so, I would encourage everybody to, when they’re first starting out, to give all the pieces of the system of whatever it is they’re learning a try themselves. Now, you might, in the long run decide: “You know what, I’m better off not writing copy, I’m better off hiring somebody to write copy.” But first starting out, you should try each of the components. So you’ve got those three elements that sort of get you started. The other thing is, for many people that are doing this, and this is sort of the fourth component I would say of all these. The fourth component is to make sure that every day you really wake up and make sure you do, you know, at least two or three things a day that move you forward in the direction of where you want to get going, because I find, for me, working, you know, working on my own, that unless I set little, individual daily goals for what I want to get done, I mean, I’m now in a position where I could just sort of sit back and do, you know, eat bon-bons and not get out of bed, and that’s just, that’s not going to cut it to get me where I want to go, so I, I do have on my calendar, every day, two or three things, not a lot, but two or three things that will move me forward in the direction where I’m wanting to go. So that, those things to get started, I think would be a good place to start for anyone listening. Danny: That’s awesome. I said two questions and you gave me the answer to four of them. So I think we’re all set, and that’s amazing. Fred, any, first of all, most important question, where can people find you? Fred: Well I’m, I, my main site, which, by the way is, I’m working on redoing a few things because I just got a consultation from somebody that I respect and they want me to make some changes, but there’s a lot of great information at Fred Gleeck, that’s F-R-E-D-G-L-E-E-C-K.com, and if you click on “Free Information Marketing Training” people can get a hold of a lot of different, you know, free – I have a lot of things on the site that are free. And again, this is meant to do one thing, and Danny, you as a marketer understand this, which is that, if anybody is listening to this, wants to learn more about me, goes to my site, naturally my idea here is to show you with some of the free information that I have, you know, how valuable and important, you know, I think things are. And if you resonate with my approach and you like what I have, hopefully at some point in the future, you may, you know, you may buy something from me, but I, I don’t expect you, after listening to this program, to immediately go out and spend a couple of thousand dollars with me because that would be, frankly, foolish, because you don’t know who I am yet. So I would encourage people to investigate and take a look at what I have and the site FredGleeck.com will give you a lot of free resources in which you can decide whether or not my approach matches yours. Danny: Fred, I think that’s very well said and I really appreciate that explanation. This has been a lot of fun, it’s been, I’m sure it’s going to be valuable for our listeners, I personally really enjoyed the conversation, I mean we see things very eye to eye with when it comes to a lot of things, frankly, like on the ethical side and in terms of the importance of proper instructional design as well, which is very absent in the industry, unfortunately. So, it’s, it’s just been fun! Thank you very much for taking the time to do it! Fred: I’ve enjoyed it as well, thank you! I almost dont wanna talk about the info-product stuff, ’cause there was so much deeper wisdom here. About education (on educating), mentor-selection, marketing plumbers, rejecting people who aren’t a fit and more. I get a great vibe from Fred and I’m confident he could revolutionize my info-products. Great interview and information! But is anyone else’s audio cutting off around the 15-minute mark? I can’t seem to get through past that point. At least the transcript is provided! This is an invaluable interview! Danny and Fred together? Remarkable synergy, authentic proven advice, and practical tips for all up and coming internet infosales, bloggers and the rest. So much to apply to my own growing business – thx to both! Excellent! Thanks for asking such great questions. I offer services but am moving towards product development as well. You both gave me a lot to think about along with some good resources. Thank you! Love it Danny and Fred! Knowing how to educate others is key to creating sensational information based products. I look forward to learning more from two masters of education. Thanks for taking the time to create both the audio and the transcript. 1. Look for spots in our niche that need caulking to determine what needs our products and program will fill. 2. Make sure that we do something each day to advance us toward our goals. 3. Give visitors to our site ample chances to get to know us and our work before we expect them to buy from us. Thank you Danny and Fred.